Greek Halva is a sweet that is cheap, easy, and quick to make...and is eaten even faster. I use walnuts, almonds, pine nuts and raisins, for extra goodness and flavor. Put the walnuts, almonds and pine nuts in a small pan and roast them for a little on a medium fire. They burn very easily, that’s why you must watch them and move the pan. When they are lightly brown place them on a plate and put them aside. Put the ingredients for the syrup in a pan and bring to the boil. Remove the foam, reduce the heat and keep it hot until needed. Place the oil in a large bottomed pan and stir in the semolina. Keep the fire low because it burns easily. Keep stirring and you will see the semolina turning a nice nutty brown. Don’t let it burn, because then it will be bitter. When it is nicely browned, add the walnuts, almonds, pine nuts and raisins and stir well. Remove the pan from the heat and leave it for about two minutes to cool down a bit. Remove the cinnamon, cloves, aniseed and peels from the syrup. Now take some syrup with a ladle and add it to the semolina mixture. Stand back and be very careful, as it splatters! Continue stirring the mixture and adding the syrup until it is finished. Return the pan to the fire. Keep stirring the halva so that it doesn’t stick to the bottom. When the liquid is absorbed, take the pan off the fire and let it stand for five to ten minutes. 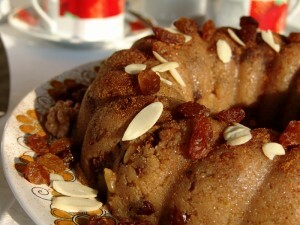 Put the halva in a cake mould, or in individual bowls. Dust the top with powdered cinnamon. Let it cool. When it is cold, you can invert the mold on a platter. Dust again with cinnamon. It is eaten at room temperature or straight from the fridge.